PETITION: A Plea For Support Demonstration Attendance From All Freedom-Loving Activists around the world in our united fight against fanaticism! PETITION: A Plea For Support & Demonstration Attendance from all Freedom-Loving Activists around the world in our united fight against Terrorists, Islamofascists, and Fanaticism! Date & Time: Thursday, July 8, 2004 from 11 a.m. Date & Time: Wednesday, July 7, 2004 – from 5 to 8 p.m.
Place: At the "Le Gala" room of the "Intercontinental Hotel" (former Kempenski) located at the junctions of North Dallas Parkway and Arrapaho Rd. Place: In front of Federal (Old) CourtHouse. gather to extend their voice. Place: Corner of 4th Ave. and Pike St. Date & Time: Saturday, July 10, 2004 - from 3 to 5 p.m. Date & Time: Saturday, July 10, 2004 – from 2 p.m. Date & Time: Thursday, July 8, 2004 – from 5 to 6 p.m. 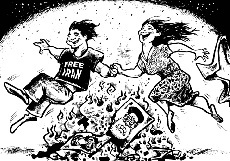 Organized by: The Constitutional Party of Iran, Iran's Freedom Forces, Iranian Freedom Movement, Munich's democrats. Date & Time: Thursday, July 8, 2004 – from 12 noon to 4 p.m. Date & Time: Thursday, July 8, 2004 – from 4 to 6 p.m. Date & Time: Thursday, July 8, 2004 – from 4 to 7 p.m. Date & Time: Wednesday, July 7th, 2004 - from 12 P.m. Date & Time: Thursday, July 8th, 2004 - from 1 p.m. Date & Time: Thursday, July 8th, 2004 - from 7 P.M. to 9 P.M. Date & Time: Saturday, July 3th, 2004 - from 2 P.M. Date & Time: Wednesday, July 7th, 2004 - from 2:00 P.M. to 4:00 P.M.